A new system from Volvo will allow drivers to use high beams all of the time. The system may, or may not have a bright future. 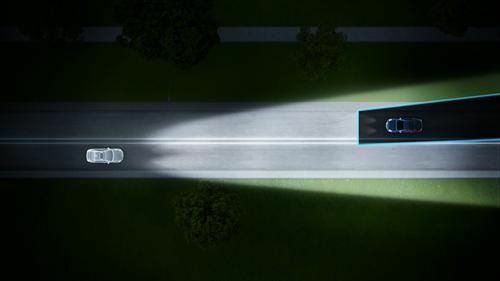 Volvo has created a new headlight technology that allows the high beams to be used all the time without blinding oncoming drivers. The technology is available now on Volvo’s ’60 series of cars, the V wagon, S sedan, and XC compact crossover. Other technologies to allow drivers to use high beams without dimming have been on the market for many years, but the Volvo design is unique. This is just the latest in a string of innovative safety features from the company known for advances in the area. Called Active High Beam Control, the technology allows the high beams to be on all the time. When a vehicle approaches and the beams need to be dimmed, the lights automatically shade just the part of the beam that would have blinded the on-coming driver. Clearly, the advantage is that the areas outside of the shaded area remain illuminated. Thus, the sides of the road, and the road far ahead that would not be lit by the low-beams, still remains illuminated. Lotta Jakobsson of Volvo said in a press release that "The technology makes driving at night more comfortable and safe. It also makes it easier to focus on the driving and is an excellent example of our Designed Around You approach, always focusing on features that really make a difference to the customer." The system uses the camera located above the rear-view mirror that now plays multiple roles in the Volvo safety system. That camera also is a key part of the accident mitigation system. Inside the light fixture a metal cylinder moves to shade the part of the beam that would dazzle on-coming drivers. Although the system may not add much to the cost of a new vehicle, headlights are already extremely expensive. For example, a headlight cover assembly for a used Toyota Highlander has a parts price of $280.00 – without bulbs. A headlight with this level of complexity could easily cost $ 1,000. Might this technology lead to higher repair costs from minor collisions, and thus higher insurance costs? Then there is the issue of driver preference. One technology that the Insurance Institute for Highway Safety has studied and found to reduce accidents is adaptive headlights. These are the headlights that move slightly to show the road ahead while turning. Although some customers like the movement, so many don’t that Lexus recently dropped this feature from its flagship 2013 RX30 series that competes directly with the Volvo XC60. Those customers are exactly the same demographic. Will they like the new headlight system? Lexus also has an auto-dimming high beam system. It uses the incoming light from the headlights of approaching cars to know when to dim the high beams. However, it also sees the reflection of its own lights back from signs and other roadside reflective items and it dims the beams unnecessarily so often that the system can be annoying. For that reason, the system can be disabled at Lexus dealers. This technology is not the same, but the question remains, will customers like it, or will they want it off? Volvo is a leader in safety technology and should be lauded for its ongoing efforts to make driving safer for luxury car buyers. However, the time has come to scrutinize new safety systems and ask if the benefits outweigh the costs.